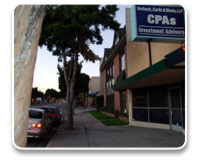 Established as a CPA firm in the city of Burbank since 1955. Investment Advisors. Life, medical, disability, long-term care insurance. From our only office in Burbank, California, we have been providing accounting services, sound financial planning, and income tax preparation to businesses and individuals throughout Southern California and the United States since 1955. Our CPA’s and tax preparers are full-time professionals who have been with the firm many years. They prepare individual and business tax returns throughout the year, take continuing educations courses in taxes every year, and are involved in tax planning all during the year. While traditional tax and accounting services compose the core of our firm's business, ancillary services stretch from financial planning to business valuation, from data processing consultations to pursuit of capital and auditing services. We help clients with retirement and pension plans and estate planning. We can become controllers for our clients, offering them services in the accounting management of their company from processing accounts payable to accounts receivable to payroll services. Financial Statements: Audits, reviews and compilation. Bookkeeping Services: We will process all or part of your bookkeeping and become the “extra accounting person” you need. Business Support: We make it our business to understand your needs, and are here for you when you need us. Tax: Our goal is to ensure that you pay the minimum income taxes permitted by law. We prepare Individual Income Tax returns, Partnership Income Tax Returns, Corporation Income Tax Returns, Fiduciary Income Tax Returns and Estate Income Tax Returns. Estate Planning: We provide asset management and estate planning services intended to preserve your assets. International Tax Planning: We prepare tax returns for US citizens working in foreign countries and for citizens from other countries entering the United States. We will help you save today ….. AND in the future!